Eric Church to perform at Mid-State Fair! 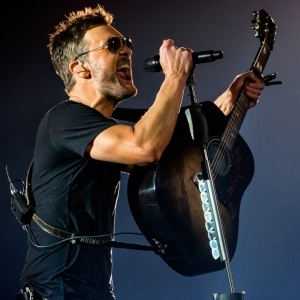 Home › Latest News › Eric Church to perform at Mid-State Fair! PASO ROBLES (CA) – The California Mid-State Fair is pleased to announce that country music superstar Eric Church has been confirmed to perform in concert on Saturday, July 21 at 7:30 pm. Special Guest is The Cadillac Three, who will open the show. Church’s concert is part of the annual Bud Light Concert Series and will take place in the Chumash Grandstand Arena at the Paso Robles Event Center. Ticket prices for the show are $51, $71, $91 and $131 and will go on sale Friday, February 23, 2018. Tickets will be available starting at a time to be determined (TBD) later, online at www.MidStateFair.com or by calling 1-800-909-FAIR (3247), and at 1:00 pm at the California Mid-State Fair box office located at 2198 Riverside Avenue in Paso Robles. The three-time Country Music Association and six-time Academy of Country Music Award winner cemented his reputation as a maverick by releasing his 2015 album Mr. Misunderstood as a surprise, delivering it to fans before announcing its existence at the 49th Annual CMA Awards and putting it on sale. His current single, “Round Here Buzz”, that is climbing the top of the charts now, follows his anti-hate single “Kill A Word” which AXS called, “one of the most important singles” Church has put out and the GRAMMY-nominated “Record Year,” which Rolling Stone dubbed “the most moving moment” on the widely lauded album. RIAA Platinum-certified “Record Year” hit the top of the charts making seven No. 1s for “one of the brightest lights in any genre” (Vulture). Church embarked on his cross-continent, 60+-city Holdin’ My Own Tour in 2017 that was named the No. 1 most attended music tour in the world at the time of the tour by Pollstar. The double-set/sans-opener show that gave fans 3+ hours of pure Eric Church sold out every stop, consistently staying on Billboard’s Country Boxscore chart despite cancelling more than 33,000 tickets listed on the secondary market in an effort to reduce ticket scalper activity. The tour hit major markets including New York, Los Angeles, Chicago, Boston and Philadelphia and ended with a two-night run in Nashville, Tenn. breaking Bridgestone Arena’s attendance record the first night and topping himself to set a new record the second. The Cadillac Three will bring their Southern Rock sound and Nashville roots to the California Mid-State Fair for the very first time. Their latest album, LEGACY, was released last fall to critical acclaim and features the band’s most infectious single to date: the woozy sing-along “Dang If We Didn’t”.